Rappai is a lovable glutton who lives in a village in Thrissur. He suffers from a rare condition that makes him hungry all the time. His loves Kochuthresia but his condition prevents him from taking his affections any further. When Kochuthresia and her sisters are harassed by local goons led by a ruthless Karim Seth, the affable Rappai confronts them which leads to disastrous consequences. Official trailer of Sahitham is out. 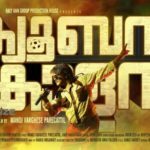 Udaharanam Sujatha Box Office Collection: 23 Days Kerala Collections Report !! Overtake Box Office Collection Report..!